Persona 5 is off to a raucous start in the west, as the game’s western launch this past week pushed worldwide shipments to 1.5 million units. Publisher Atlus previously confirmed that the JRPG sequel shipped 550,000 units when it launched in Japan last October, meaning that a million units were shipped in North America and Europe. In continuation of the franchise’s growth, Atlus promises an upcoming Persona music concert dated for August 2nd in Japan. Besides selling well, Persona 5 has gotten rave reviews all around, including a near-perfect Famitsu score and a 94% aggregate on Metacritic. This success comes in spite of severely restrictive rules for streaming the game laid down by Atlus, rules that includes the threat of Content ID claims and copyright strikes. Persona 5 marks the first true Persona game in nearly a decade, following Shin Megami Tensei: Persona 4 on the PlayStation 2 in 2008. That particular game sold 193,000 units in its first week in Japan. In the decade since, the Persona series has grown thanks to critical praise, spin-offs such as anime and manga, and related games as Persona 4: Golden and Persona 4: Dancing All Night. 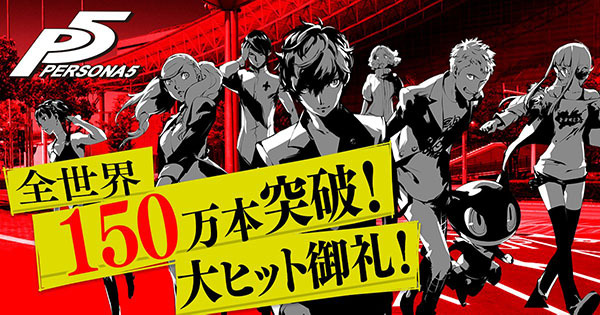 For the near future, Persona 5 fans not only have a concert to look forward to, but a suite of downloadable content as well, including a Japanese audio track, a new difficulty level, and much more releasing through July.